Crime Prevention Through Environmental Design (CPTED) is defined as a multi-disciplinary approach for reducing crime through urban and environmental design and the management and use of built environments. CPTED strategies aim to reduce victimization, deter offender decisions that precede criminal acts, and build a sense of community among inhabitants so they can gain territorial control of areas and reduce opportunities for crime and fear of crime. CPTED is pronounced ‘sep-ted’ and it is known around the world as Designing Out Crime, defensible space, and other similar terms. The ICA supports local organizations, practitioners and communities that utilise CPTED principles to create safer communities and environments. 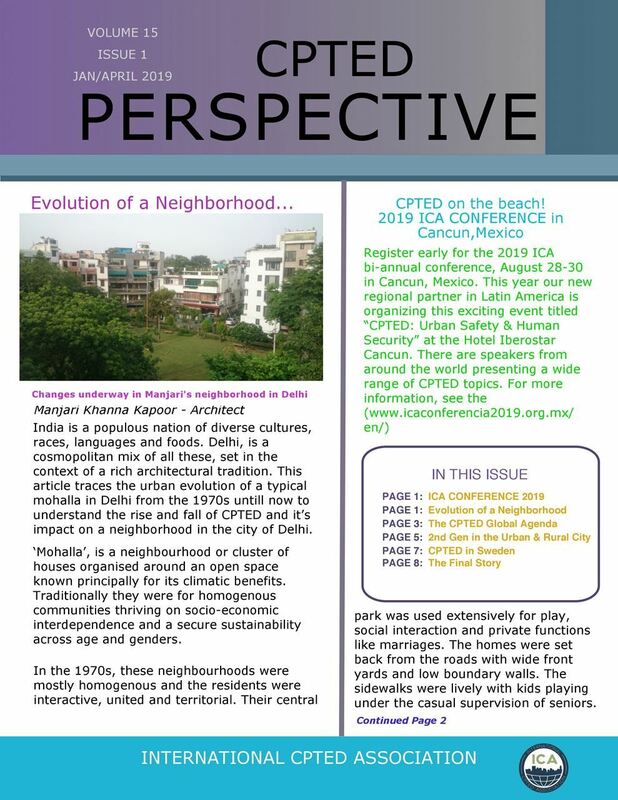 OUR NEW ICA Perspectives Newsletter from January to April 2019 now available! CPTED and Homelessness is a product of the 2015 International CPTED Association conference. Authored by Gregory Saville and Randall Atlas, this paper offers guidelines to CPTED practitioners regarding homelessness. For other ICA White Papers, click here. A project co-funded by the European Union Prevention of and Fight against Crime Programme of the European Union has developed and implemented this manual for police throughout Europe and internationally. You can download the manual in English version here. The 2019 ICA Conference Planning Committee has been working hard behind the scenes to organize the ICA Conference that will be held in August 2019 in Cancun, Mexico. This week the ICA President Macarena Rau and ICA Mexico President Mercedes Escudero held a number of presentations and meetings with the Governor of State of Mexico to secure support for the Conference. You can watch Macarena's presentation to the Governor of State of Mexico here.